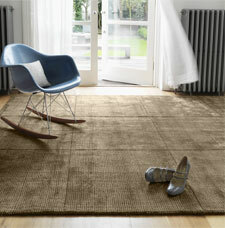 Grosvenor is a collection of elegant semi-plain hand-woven rugs. Made using a mixture of wool and viscose, the rugs are super soft to the touch and are visually stunning. In addition, clever design combines stripes and squares all in one solid colour, which gives each rug a subtle design and a plain rug’s appearance; the best of both worlds. Furthermore, the Grosvenor rugs are offered at great value. Fabric: 60% Viscose 40% Wool.